Concealer is one of the most important cosmetics products you can own in your makeup kit, especially if you have blemishes, redness, or under eye circles to cover. Because there are so many types of concealer, even some women who have been using makeup for years feel intimidated by the product. In the makeup world, true concealer is often known to be a lighter-colored, thicker, heavier face makeup. In contrast, foundation is designed to be an all-over exact skin tone coverage. However, sometimes concealer has color correction embedded in the formula, or it does need to be the same color as your foundation, not lighter. Go a little lighter than your foundation to cover up light circles under your eyes if you're not looking for the color correction that more severe circles could require. Since a thick, heavy foundation stick will conceal your imperfections, it is also known at times as a concealer. This is an option if you have a hard time finding concealer that matches your skin tone that will cover your blemishes. You may wish to use a more lightweight foundation everywhere else, however, so keep that in mind when you make your purchase, as it may not be the most economical choice. Concealers come in various forms, including creams, powders, lotions, pencils, and sticks. With the popularity of mineral makeup, some cosmetic lines have even introduced mineral-based coverups. Liquid types tend to apply more smoothly with a sheer finish. They are available in either tubes or wand containers. Cream versions are found in either a stick or pot. They tend to be drier and offer a better overall coverage, but also can be harder to apply. In many cases, creams are best used to disguise blemishes rather than under eye circles because they tend to crease and find their way into fine lines, while light-reflecting liquid concealers can lighten the appearance of circles without migrating into those creases as much. The main types of concealers are designed to cover blemishes, dark under eye circles, and facial redness or imperfections. You may find that you can't get an all-in-one concealer and you need to have different concealers for different tasks. Blemish concealers often help to dry and cover the pimple. Some cosmetics may contain medicated agents that help treat the area at the same time it is covering. Check the product to make sure your skin is not too sensitive or allergic to the ingredients. The color base of most concealers formulated for blemishes is yellow or green. Although it may seem strange to apply this color of cosmetic to a facial area, the yellow or green hue will actually help that will counteract the reddish, reddish-purple, or bluish color of the blemishes. Use yellow on older, darker spots that have a purplish appearance and green on any redness you have. Some blemish covers more closely match the colors of typical foundation. When you're covering blemishes, you don't want to highlight them by using a lighter concealer, so choose one that matches your skin tone as closely as possible. 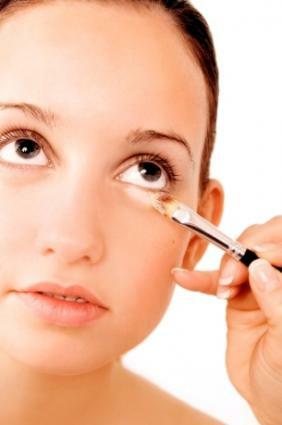 Apply concealer carefully to the blemish using a clean brush or sponge, or the tip of your finger. Take care not to apply too much product, as a common problem with application is too much concealer, which can leave the area around the pimple looking cakey. Apply a yellow-or-green-based concealer before foundation. If you are using a skin-toned concealer, you can apply it to the blemish before or after foundation. Set the area with powder. If the blemish needs re-covered during the day, gently wipe off the old product and reapply rather than layering more cosmetic on the affected area. No concealer overview is complete with addressing rosacea. In the face, redness and rosacea can be concerning for many women who want to have a clear, flawless face. A green-based concealer can work well to help neutralize facial redness. Small blotches or sections of redness can be effectively concealed with standard products, but for large areas, a cream or lotion formula may work best. Mineral cover may also be successful for rosacea. Whether from heredity, stress, lack of sleep, or other issues, many women deal with the frustration of dark under eye circles. Fortunately, these can be successfully covered with the right product. Under eye circles need a concealer with a moist base to prevent drawing attention to any fine lines, or creating a dry environment for the delicate under eye area. Choose a color that is similar to your skin tone, but a little lighter (not more than two shades lighter than your regular foundation, or you will get a 'ghostly-eyed' or 'raccoon' look). Salmon-colored concealer also helps cancel out blue tones under the eyes. Choose a salmon-toned concealer like makeup artist Eve Pearl's if you're hoping to get color-correction and coverage at the same time. To apply, gently dot the concealer under the eyes using the ring finger. Lightly tap and roll to blend, using care not to tug or pull on the skin. Like all types of face makeup, concealer is best applied in light layers - ensuring that you receive enough coverage, but not too much. While it does an outstanding job of making those pesky imperfections disappear; the trick lies in making the concealer disappear, too. Which Comes First: Concealer or Foundation? When using as a highlighter or to cover dark areas, it is best to start your makeup routine with it. Then, the rest of your makeup can be applied over the uniform complexion. In contrast, when using a face makeup stick for hiding redness and blemishes, it is actually preferable to apply your face makeup first. As you may discover you do not need as much once the rest of the makeup is on your face. You can also use it as a primer for your eye shadow or lipstick, which will ensure an even color application with a longer life. When applying, start with a small amount, either on your finger, wand or makeup brush. Apply to the area you would like to cover and blend well. If using an all-over foundation, you can add additional coverage and balance the area by applying the foundation over the concealer and then a layer of face powder to seal it in. Even if you are not using a foundation, always pat with powder to keep your imperfection hidden. For an area that requires a precision of application, like a mole or spider veins near your nose, you may want to consider a tiny makeup brush for more accuracy. When using around the eyes, remember to also apply to the dark area at the inner corner by the nose. Concealer is especially useful for blotchy skin and often evens out the skin enough to avoid the use of an all over foundation. Evaluate your face's needs each morning, as different days will require varying amounts of coverage. Concealer is a key component in anti-aging cosmetics as it helps to hide the negative effects of the sun. Use a lightweight concealer on your eyelids if they are particularly full of dark veins. Employ concealer as a highlighter; apply to sunken areas to reduce the shadows. Try a small dot of concealer on the center of the lips between your coats of lipstick for a plumper lip appearance. Consider mixing your with eye cream for a smoother lighter coverage. Be careful not to apply too much product. This will draw attention to the problem area rather than hiding it. Concealers have several purposes, and it will be hard to choose just one. If you have dark circles under your eyes and blemishes anywhere else on your face, you'll need at least two. Whether you opt for color-correction or just two concealers--one that's a shade lighter than your foundation and one that matches exactly--is up to you. They may not be in the same line, either, as you can choose heavier stick or cream concealers for blemishes and liquids for under the eyes. It may take some trial and error to find the right mix of concealers for your skin's needs, but once you find what works, you'll be amazed by the difference concealer can make in your overall appearance, even without a full face of makeup.